Palestinians deserve an independent state living in peace and security alongside Israel. They’ve suffered enough; their cause is just and compelling. Israeli settlement activity continues unabated. In fact, in a truly bizarre and tortuous bit of twisted logic, a recent report by a committee created by Prime Minister Benjamin Netanyahu actually recommended sanctioning the Israeli activity. My regular readers know that I applauded the Levy report as a breath of fresh air which could finally bring the government of Israel out of the ghetto it voluntarily created when it ceded its legitimate rights and adopted its enemies’ language of ‘occupation’. And while I think that Palestinian Arabs have certainly suffered, I also think that the “Palestinian Cause” is no more or less than a racist war against Jewish self-determination — and that the agent of Palestinian suffering has not been Israel, but rather the truly awful Arab leadership. So Miller and I are not at all on the same page. On the other hand, he has worked for six American Secretaries of State as an adviser on Israeli-Arab negotiations, and has written four books and countless articles on the Mideast. The least we can do is listen to what he says. 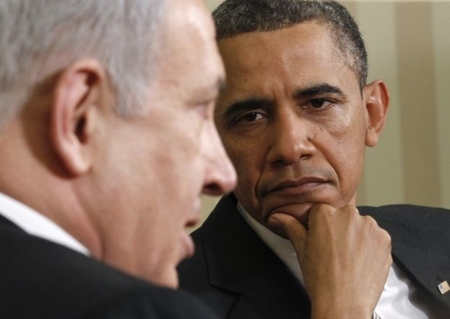 If Bibi seems weak, Obama has left no doubt that he has strong views when it comes to the U.S.-Israeli relationship. And he hasn’t changed his views of Israel or Netanyahu, even if his first failed run at the peace process and the impending presidential election have caused him to back off. It’s true that the president doesn’t emote on many policy issues, with the possible exception of health care. But on Israel, he just doesn’t buy the “tiny state living on the knife’s edge with the dark past” argument — or at least it doesn’t come through in emotionally resonant terms. In this respect, when it comes to Israel, Obama is more like Jimmy Carter minus the biblical interest or attachment, or like Bush 41 minus a strategy. My sense is that, if he could get away with it, the president would like to see a U.S.-Israeli relationship that is not just less exclusive, but somewhat less special as well. Right-wing Israeli leaders have found ways to cooperate quite closely with American presidents in the past. But this time around, it’s not so easy. The problem is not only one of policy and perceived interests, it is personal, with Obama’s dislike of Netanyahu a matter of public record. It seems to me that not only are relations between Israel and the US worse than ever, they have the potential to get much worse if Obama is reelected and is no longer constrained by electoral politics. And now is the worst possible time for this to be the case. This entry was posted on Wednesday, July 25th, 2012 at 4:33 pm and is filed under General. You can follow any responses to this entry through the RSS 2.0 feed. Both comments and pings are currently closed. “Relations have never been worse” and you could have added “or under a worse President” ! ” It seems to me that not only are relations between Israel and the US worse than ever, they have the potential to get much worse if Obama is “reelected and is no longer constrained by electoral politics”. The other scenario is if Obama is “not re-elected in November and is no longer constrained by electoral politics”. Will that be any different than if he is elected? Consider that no other president in US history has put in place so many Executive orders of the type that Obama has. Obama’s Executive orders if invoked – will by pass congress and place the entire nation under his personal power and control. (Go read the orders of the last 18 months) The latest ones giving Obama control over all media and communications must have implementation action plans in place within 60 days of their June signings. This is a government that has already dispensed with the Constitution, they are looking at this as their only chance to irrevocably change America before the people wake up. Do you really think that these people ion power are going to play by election rules if defeated? Why would Obama put n place such executive orders? Election win or loss does not matter – the Executive orders once invoked invovle teh formal suspension of the constitution and allow Obama (or any other President) to cling to the presidency for life. Anything in particular that you are concerned about? I am fairly confident that Obama will be defeated. He can only win if Ron Paul runs third party and fractures the GOP vote, or if he himself bombs Iran and this is judged to be a successful operation. Neither of these gaurantee he’d win, either, but they’d give him a good chance. And with Ron Paul’s son, Senator Rand Paul, already ensording Romney, and given Obama’s reluctance to seriously threaten Iran up to now, I see these two scenarios as unlikely at this point, though still possible. Beyond that, he could try to rig the election. But GOP governors in most states – including key battleground states such s Florida and Ohio – will make this difficult for him. Or, he could try to “pull a Marcos” and indeed attempt to establish himself as some kind of dictator with an open-ended reign. However, the professional military in this country is sworn to defend the Constitution against ALL enemies, foreign and DOMESTIC. I have it on good authority that the top brass here DESPISES Obama, and they’d never back him in this. The economy stinks, and is not going to get better in time for election day. His foreign/defense/national security policies, excepting the killing of OBL, have beein utterly disastrous. Barring the scenarios I list above – again, none of which seem very likely right now – I just can’t see him winning a legitimate election. Having spent a lot of my collegiate life among liberal lefty types, and at least on domestic policy, being one myself for some time, I can tell you all that Obama is making the classic mistake that most lefties make, which is greatly overestimating the degree to which Joe and Jane Six Pack support his policies and see him as the “champion” of their interests. Never mind the polls we are seeing right now showing Obama and Romney either even, or Obama somewhat ahead. Carter held high single digit or low teens leads over Reagan throughout the summer of ’80. Even in October of that year, Reagan and Carter were running neck-and-neck. Reagan went on to deliver the worst electoral defeat of any sitting president in U.S. history. The Obama-backing media will prevent that lopsided a result this time around, but the media alone cannot save Obama. All that said, however, while “MDA” above may worry excessively over Obama’s executive orders, one point he (or she?) makes is very relevant. Even if Obama is defeated in November, there’s the two and half months he’ll have left as a ‘lame duck’ president. Having nothing to lose, he’s going to be EXTREMELY dangerous then. I am very worried about this myself. There are more Democrats than Republicans. Barring third-party surprises, a Republican must get democratic votes to win. Reagan was an exceptionally good speaker and campaigner, and got it just right. Romney is no Reagan. In addition, the failure of Carter’s attempt to free the hostages in Iran hurt him a lot. Yes, the economy is a disaster. Romney has not — particularly from the point of view of the people who are hurting the worst — inspired confidence that he can improve it. – Had the albatross of the Bush administation around his neck, the most unpopular president by the end of his term since Nixon. – The economy was in free fall by election day, a fact popularly, if inaccurately, blamed on the GOP. – Obama had outspent him at least two-to-one; I’ve heard four-to-one from some sources. Obama was an unknown quantity to most Americans then. (There was no excuse for this, but when so many voters treat an election like an episode of “American Idol”, what can you do?). But today, Obama has a record, and it is terrible….and thus, easy pickings for Romney’s ads. And this time, Obama ain’t doing so hot in relation to his opponent on fundraising. I understand Romney is raking in the $$$ lately. Now, consider that not a one of those 47% who voted for McCain in 2008 are going to vote for Obama in 2012. That’s a big “base” to start with. A recent poll by a major polling organization (I think it was Gallup or maybe Quinnipac), revealed that approx two out of five likely voters believe that Obama has ‘changed the country’, and for the worse. That is also a good base to start with. A mutual friend of ours saw Romney live a couple of weeks ago at a town hall meeting. He was hugely impressed, said that if Romney keeps up the level of performance he saw there, he’ll be a cinch to win (and this same friend saw McCain in ’08, and was not impressed by him at all…not like he automatically favors GOP candidates). You, Vic, live in California, which Obama won by the largest margin of any state in ’08 (I think it was 20 points), and I understand in spite of everything, Obama is still very popular there. I can see where your environment might make you a little, ah, “pessimistic”. I stand by what I said above. Six months to go. Gonna be a rough ride between now and then, tho’.